The braking system does a lot of work and the brake pads take the brunt of the punishment. It is a good idea to have your brake pads checked every 6 months or when you suspect a problem. Symptoms include squeaking, grinding, or increased stopping distance. Most pads have a thin metal tab which vibrates against the rotor when the pads wear down to a dangerous level. Some pads do not have this and if not checked periodically can wear down far enough to ruin the rotors. Many import cars have wear indicators that set a warning lamp on the dash telling the driver it is time for brakes. A modern trend is to make the brake pads very hard thus extending life. This harder material can squeak and sounds like the wear indicators. Brake dust can also cause squealing but can be fixed by spraying brake cleaner on the brake system to remove the dust. This is more common in newer cars, but possible on all disc brake systems. Rotors warp due to being overheated or incorrect tightening of the wheel. A warped rotor will give a pulsing feeling when applying the brakes. This pulsing can be annoying and dangerous. Most new cars have rotors which are very thin and warp very easy. Furthering the problem, the manufacturer does not leave enough material to resurface the rotor. If your rotor can be resurfaced the rotor is placed in a lathe and a cutting tool removes a few thousandths of material from the braking surface. This restores the flatness of the rotor and eliminates the pulsing sensation in the pedal. Brake fluid absorbs moisture from the air over time, which leads to soft or sluggish brake response. This very moisture may also lead to corrosion which may cause premature failure of brake system components. Many vehicle manufacturers recommend a brake fluid service every 2 years or 24,000 miles for optimal safety. On steep grades consider downshifting to save your brakes. Only do this when traction conditions are good. In ice, snow, or even rain, downshifting into too low of a gear may cause a skid. Downshifting lets your engine do some of the braking instead of your brakes. Keep your wheels and braking system clean. Clean brakes work better and keep temperatures down. Use a good wheel cleaner which you know is safe for your wheel finish. Let our factory trained technicians inspect and repair your brakes if you hear noises or feel pulsations in your pedal. We try to inspect all your safety items every time you come in. 90% of automatic transmission failures are due to overheating and fluid contamination. A typical transmission drain and refill service replaces only 40% of the old contaminated ATF. The remainder is trapped inside valve bodies, the torque converter and transmission cooler lines. New ATF from conventional drain and refill service can often loosen damaging sludge and varnish deposits leading to shift problems and even transmission failure. Transmission Flush Service safely removes sludge and varnish deposits and replaces over 95% of the used fluid, then conditioners are added to the fresh ATF to extend ATF life and help maintain smooth shifting. Our technicians are qualified to diagnose and repair your transmission. If we find you may have extensive transmission repairs needed, we always try to give you as many options as we can to fit your personal needs and finances. Yes, tune-up is still a relevant service, whether it includes spark plugs or not. When your car is properly tuned, the ignition system, fuel system, emission system and computer system are all working together. This results in peak combustion chamber efficiency, saving you money at the gas pump and making sure your car is emitting a minimum amount of pollutants. How do I tell if my vehicle needs a tune-up? Check your owner’s manual. Tune-up intervals vary by vehicle. Many people assume a tune-up will solve a drivability problem. That’s not always the case. Our experts perform a tune up verification to confirm that your car will benefit from a tune-up. Your problem may be unrelated to a tune-up and may need an engine diagnosis. What does a Dallas Precision Imports Tune-up include? This service, like all services performed at Dallas Precision Imports, is advised based on your manufacturer’s recommendations, or as needed as determined by our inspection and based on industry standards. conditions, is vital for your vehicle and can help you avoid costly problems. Some vehicles require synthetic oil and have maintenance reminders that need to be reset. They can drive 10,000 miles or more between services. With each oil change, the oil filter should also be replaced. We’ll also walk you through your vehicle manufacturer’s recommendations for mileage and age related services that may be due. Have you ever driven down the road and had the feeling that your car wants to turn when you want to go straight? That’s called pulling or drifting. Maybe you hit a bump and the car kept bouncing, and bouncing. Not good. And not safe. To maintain control, your car’s wheels need to be in firm contact with the road at all times. That’s where your suspension system comes in. It needs to be able to absorb bumps smoothly and steer properly, which in turn requires a fully functioning suspension system. That’s where our expertise at Dallas Precision Imports can help. Whether your vehicle has a conventional suspension system with shock absorbers, or a strut-based system (which is typical in many front-wheel-drive cars), or a hydraulic type system, Dallas Precision Imports has the know-how to diagnose and repair any problem. Ball joints, bushings, steering linkages all of your front end problems don’t have to be a problem. Besides pulling and bouncing, telltale signs include uneven or excessive tire wear and poor steering control. If you notice any of these symptoms, or if you have questions about steering or alignment, stop by or call Dallas Precision Imports. You can count on our skilled technicians to help make your ride as safe as it is smooth. Your engine runs on air, fuel and spark. The spark is the center of it all and for that we need electricity. Your battery supplies electricity but only enough to get you a few miles down the road. We need more and that’s where the alternator comes in. The alternator continually charges the battery so that we never have to worry about that whole “running out of juice” problem. Your battery is 12 volts, but to keep the battery 100% charged and run all of your car’s electrical doo-dads at the same time, the alternator has an output of between 13.5 and 14.8 volts. Many people think if the battery light comes on they have a battery problem, which is not always true. Most of the time the light is to tell us the charge system has failed. If this happens to you, you may have a limited time of driving because now you are relying on the battery until it runs out. Dallas Precision Imports technicians are experts at diagnosing electrical and charging system problems. If your car won’t start, the lights are getting dim or the battery light comes on, please call ASAP and let us help diagnose your car. Is your engine overheating? Not surprisingly, your engine’s combustion process generates heat. What you might find surprising is that, without a functioning cooling system, your engine’s heat is great enough to damage the components of the engine itself. Aluminum heads can warp. Head gaskets can blow. Engines can fail. And you and your family can be left stranded. Which is why if your car overheats, the cooling system should be inspected and repaired immediately. Count on Dallas Precision Imports to help keep your car’s cooling system operating safely and efficiently. We recommend having coolant replacement performed according to your car’s factory recommended maintenance schedule. This regular maintenance of your vehicle’s cooling system can help avoid costly repair services, and help keep you safe. 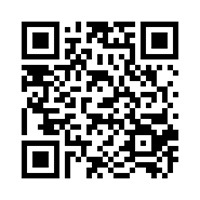 Stop by Dallas Precision Imports with any questions you have or to determine when your vehicle needs this critical service. Did you know that sooner or later your vehicle’s engine accessory drive belts and coolant hoses will dry out and crack? Over time, belts and hoses lose their ability to properly expand and contract. So, stop by and we can help you avoid this kind of breakdown. In addition to oil changes, we also provide a range of preventive car maintenance services, including belt and hose replacement. Our experienced technicians can detect many potential belt and hose problems with a simple visual inspection. Regular inspections, coupled with timely belt and hose replacement in accordance with your vehicle manufacturer’s recommendations, will help protect against expensive repairs. Dallas Precision Imports can service and repair your engine with timing belt maintenance, major mechanical repairs including engine replacement, head gasket and valve job repairs and much more. We have many options for whatever your needs may be. 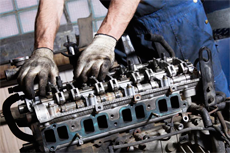 Engine repair and service are considered to most people the mechanical operation of an engine – piston, valves, timing chain and gears, oil pump and lubrication. This really is the life of your engine. All these have been around since the first engine was designed. It is the stuff we put on the outside of the engine that keeps changing. If you ever need any help with your engine or mechanical repairs, let us help you. We can diagnose, repair and replace your engine the right way and put it back to original quality. It starts as a smell. The unmistakable odor of burning insulation. Shortly thereafter a wisp of smoke curls out from under the dash. Then comes the similarly unmistakable pop of a fuse blowing. At which point your radio cuts out. Or maybe it’s the windshield wipers that stop… or the engine itself. Maybe your battery goes dead over night. No doubt about it, you have a short circuit. It may well be that the source of the short is obvious, like that wiring dangling under the dash. On the other hand, you may need to do some serious troubleshooting to find the source of the problem. A short circuit occurs when an energized conductor touches either the frame or body of the car or another wire. Shorts to ground usually will have low enough resistance to draw sufficient current to blow the fuse. If the short is to another circuit, you may see things like the dome light coming on when you hit the turn signals. You may discover a wiring harness or connector meltdown caused by the heat liberated from a short or high-resistance connection. Moreover, not all wiring problems are shorts – open and intermittent connections also can make your life difficult. Dallas Precision Imports is experienced in all engine and body wiring problems. If you need help or have an engine wire problem, let our technicians diagnose it for you. Yes, cars have computers and plenty of them. They’ve snuck up on us over the past couple of decades or so and quietly assumed a central role in our daily transportation. In fact, they are vital. While for many of us computers and internet access are part of our daily work, we can still live and work without them until they’re back online. If a car’s computer is down or doesn’t work right, the car won’t work (or at least it won’t pass an emissions test). 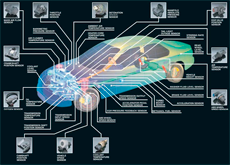 That is because these days all major functions of an automobile are controlled and monitored by computers on their own networks. If something goes wrong with the car, the computer will know and record a fault code long before a light comes on the dashboard (the automotive industry calls that a MIL or Malfunction Indicator Light) alerting us that something is wrong. Some of those problems are simple and will be taken care of next time you go in for a service. Others are not and, if unchecked, can damage or destroy the engine. Bottom line – our cars have computers and networks but most of us don’t even know where they are and what they do. Dallas Precision Imports can professionally diagnose and repair all computer problems and in most cases even reprogram the software if needed. in printed form. Technically we do not do Chassis repair we do alignments and if the parts that allow a correct alignment are worn or defective we can tell this immediately and recommend that they be replaced. This problem can reduce gas mileage, cause tires to wear out early or worse case; the part fails causing loss of the ability to steer. 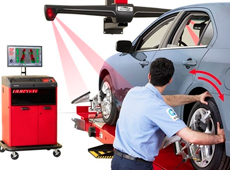 Anytime your car pulls to the right or left or the steering wheel is not straight that is a signal to have the alignment checked and make the necessary adjustments to correct the problem. If not taken care of this could cost hundreds of dollars in damage in tires or front end parts or worse a crash. Our alignments are done by machine and the laser makes it exact to factory specifications every time.